→Is Gatorade Good For Dogs? Top athletes in all different types of sports adorn the commercials for the sports drink we all know as Gatorade. The beverage, which comes in dozens of different flavors, was originally created as a way of replenishing the fluids lost by football players for the University of Florida. In time, all kinds of major sports teams started to adopt this drink to give to their players to also replenish their fluids. Over the years Gatorade has even grown into something that people drink when they are not feeling well. Getting this fluid back into your system can help a person who has been experiencing symptoms of diarrhea and vomiting. Since it tends to help out so much for human beings experiencing those types of symptoms, some have wondering if Gatorade is good for their dogs as well. Dogs don’t sweat like human does, but they can still be dehydrated. They still lose fluids through other means and they can start to feel ill the same way that human beings do when we do not have enough water in our bodies. Thus, it is a good idea to check on your dogs from time to time to ensure that they are getting the proper amount of water in their diet. In some cases dogs simply over exert themselves while playing, particularly in hot Summer weather. They can start to fill sick if they are not given the opportunity to cool down and regain their composure so to speak. It can lead to other health problems down the road if they are exposed to being dehydrated on a regular basis. Is Gatorade A Good Idea For Dogs? Since Gatorade is so commonly used to help humans who are experiencing dehydration wouldn’t it stand to reason that this would be something that we should also give to dogs who are experiencing the same thing? After all, replacing water and electrolytes in a dog is very important too. That is what Gatorade is known to do, so shouldn’t we give this to our lovely fur babies when they are not feeling so well? The quick answer to this is “Yes”. You can in fact give your dogs Gatorade without fear of adverse impacts. Dogs are able consume Gatorade just fine, and it may in fact be one of the best things to give them if they are dehydrated. 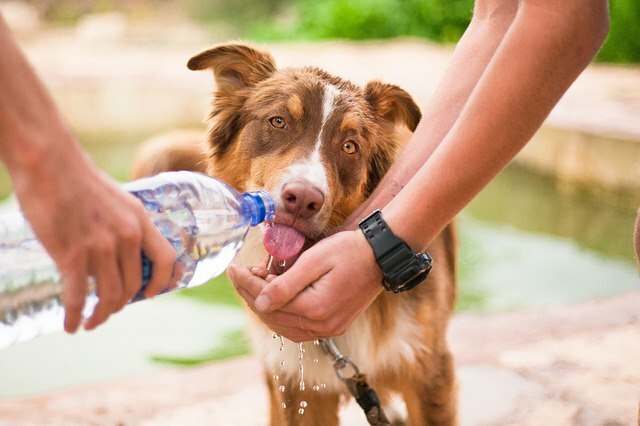 Water is perfectly fine to give to a dehydrated dog as well of course, but if there is no easy access to water but you have some Gatorade on you for some reason, then this is something that can be given. The Gatorade is going to do the same tricks for your dog that it does for you in terms of replenishing fluids. However, there is a big difference between a dog drinking Gatorade and a human drinking it. The major difference comes in the fact that Gatorade has a lot of sugar and sodium in it. That is not that big of a deal for a human being to drink, but the dogs has a much smaller body. What may be a reasonable amount of sodium or sugar for a human to consume could be way too much for some particular dogs. Always be mindful about portion control with anything that you might give to an animal. It is best to try to dilute the Gatorade that you give to your dog in order to reduce some of the potential harm of the sugar and sodium in the beverage. The mixture should be fifty-fifty between water and Gatorade if at all possible. You can also throw in some ice cubes to help dilute the drink a little bit more. A lot of dogs tend to like cubes anyway, so this may encourage them to come check out what those ice cubes are doing in their Gatorade beverage. Since Gatorade is going to be a brand new drink for the vast majority of dogs, it is nice to let them warm up to the idea of consuming it at all. They may have some reservations about it in the beginning, but with time most dogs come around. Dehydration is not something that you should just ignore. One of the worst things to do if your dog is in destress with this is to ignore it or hope it passes. It is also not the time for you to do Gatorade experiments just to see how it goes. Your dog can have Gatorade and you already know that now. Don’t wait until your dog is experiencing dehydration to see how it goes on your own. A dog that remains dehydrated for too long can go into shock in some cases. If left to go on for too long, the dog can even die from this. The canine is similar to human beings in this way. Since you would certainly not leave a human being to see how they fared with dehydration, you should also not do this with a dog. Make sure to take care of them as quickly as possible. Keep stored in your memory bank somewhere the fact that you can give a dog Gatorade to help with dehydration. It may just help to save a dog’s life at some point.